The association, formerly known as the Residents and Shop-Owners Association and constituted on 3rd June 2004 at St Philips Church, shall now be called Romsey Action, as agreed at the meeting held in the Jordan Room at Romsey Mill on 11th January 2012. The aims of the association shall be to liaise with statutory and non-statutory agencies in order to improve the quality of life in the Romsey electoral ward, and to engender a sense of community through the provision of social activities. 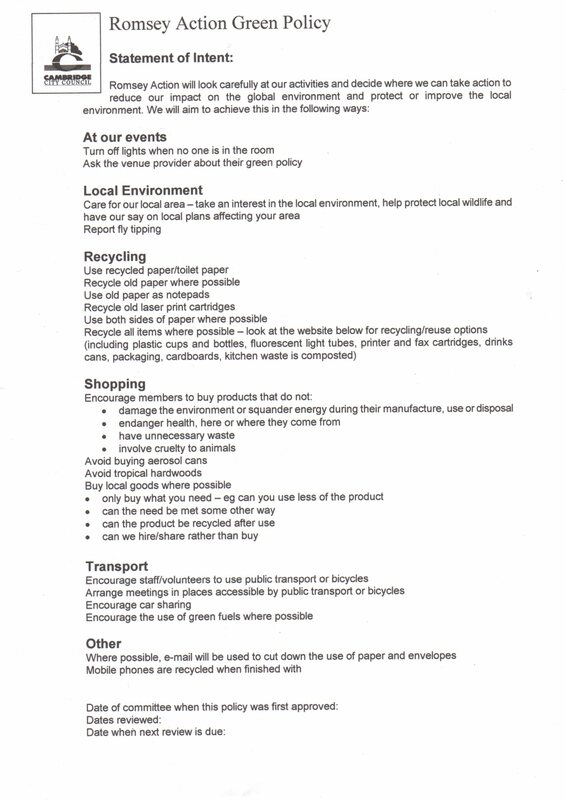 The association adopts a Green Policy as recommended by Cambridge City Council. Membership of the association is open to all who live or work in Romsey regardless of gender, age, religion, sexual orientation, or ethnic origin. There will be an annual membership fee of a minimum of £3 (£1 unwaged). Meetings will be open to the public but only members may vote on policy or financial matters. A committee shall be elected at the annual general meeting (AGM) and shall consist of no more than six and no fewer than four members of the association. The committee shall have the power to co-opt up to six extra members should the need arise. Should a vacancy occur, the committee can co-opt a member to fill the vacancy until the next AGM. If a committee member seeks political office, s/he should resign from the committee whilst still being welcome to continue as a member of the association. If s/he is not elected, the committee post can be resumed. The AGM shall be held in the month of October each year. Fourteen days notice of this meeting shall be given to all members. At the AGM, the Committee shall provide financial and other reports as the members require. An extraordinary general meeting (EGM) can be called at the discretion of the committee, or by written request to the secretary, stating the reason for calling the meeting and signed by no fewer than half the committee or ten per cent of the membership. Such an EGM shall be held within twenty-eight days of the receipt of the request with at least fourteen days notice of the meeting being given. All decisions taken at an AGM are effective from the meeting date. The association funds shall be deposited in a Community Account with the Cambridge Building Society, Mill Road. Withdrawals shall only be made with the joint signatures of two committee members. These two members shall not be of the same family. The association shall conduct its business in a non-party political way. The association may be dissolved if deemed necessary by the members in a majority vote at an AGM or an EGM. Any assets or remaining funds after debts have been paid shall be returned to their providers or transferred to local charities or similar groups at the discretion of the committee. Any changes to this constitution must be agreed by a majority vote at an AGM or an EGM. It was agreed that the membership fee should be increased from £1 (50p unwaged) to a minimum of £3 (£1 unwaged) and that a Green Policy should be adopted as recommended by Cambridge City Council.